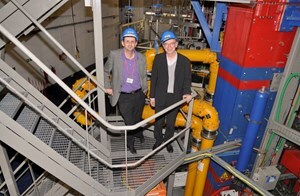 Gabriel Marbach (right) and Alain Bécoulet are among those who ''raised'' the ITER project almost from infancy. Even in the most difficult moments—and there were many—their faith never wavered. Gabriel Marbach, who joined fusion research in the early1990s, retired on 1 December from his position as head of the CEA Cadarache-based Institute for Magnetic Fusion Research (IRFM). He is succeeded by Alain Bécoulet, a physicist trained at the prestigious Ecole Normale Supérieure who was recruited by CEA in 1987 when all French fusion labs were moved to Cadarache. Bécoulet, who defines himself as "a physicist with a strong taste for experimentation," worked for JET (2000-2001), where he led the Advanced Tokamak Physics Task Force and later organized the Integrated Tokamak Modelling Task Force—an important stepping stone for the worldwide ITER collaboration. At IRFM, from 2004 until last week, he led the plasma heating and confinement division. He had been Marbach's deputy since 2010. Both men have had ITER on their horizon for the past thirty years and both worked hard to make ITER happen ... from just the other side of the fence. On the occasion of the passing of the torch at IRFM, they reflected on their experience in fusion and on the ongoing relationship between fusion labs throughout the world and the ITER Project. Marbach and Bécoulet are among those who "raised" the ITER project almost from infancy. Even in the most difficult moments—and there were many—their faith never wavered. "We always believed in ITER but we knew it would take time," says Marbach. "The main challenge was to agree on the technological compromises that would make the cost acceptable. This explains the long and slow development of the project." 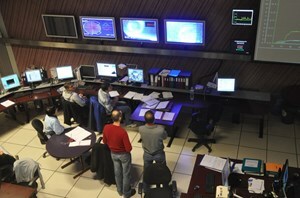 In Tore Supra's Control Room during a recent plasma shot. ''Individual installations must now become tools for the whole fusion community,'' say both Marbach and Bécoulet. When the ITER site was finally chosen, the ITER Organization established, and work launched on the Cadarache site, both men confide that they felt "like parents who watch their grown children leave home and live their own lives"—proud, of course, "but with a slight tinge of sadness." Now that ITER is living an independent life, parental guidance has graduated to "collaboration" and "partnership." And what is true of IRFM is also true for dozens of other fusion labs throughout the world. The relationship between fusion labs, and on a more personal level between fusion scientists, has always been very strong. What has changed in recent years, Marbach and Bécoulet both note, is the outlook: "Research and development used to be machine-oriented. Now it is competence-oriented. This is something we owe to ITER: individual installations must now become tools for the whole fusion community." Installing "ITER technology" on other fusion machines, such as the ITER-like wall at JET or a tungsten divertor at Tore Supra (the proposed WEST project) aims precisely at that. "I made sure that ITER became our priority," says Gabriel Marbach of his time at IRFM. "There are many things we can test and demonstrate at IRFM before the ITER machine enters its operation phase," adds Bécoulet. "We will save time for ITER, which means we can contribute to saving a lot of ITER's money ..."
What Marbach and his predecessors initiated, Bécoulet will continue. ITER however, is not the only item on his agenda. "ITER is a scientific tool," he says. "It's like a satellite: launching the satellite successfully is, of course, essential. But what matters more are the observations it will make, the data it will collect." This precious data collected at ITER from realms that have not yet been explored will form the basis of fusion development in the 21st century. Both Marbach, who will keep an office at IRFM, and Bécoulet who now runs the Institute, are determined to keep their team in the race, ready for ITER and beyond.